Fall 2018: co-taught with American architect Susan Jones (the 2018 Walton Critic), architectural investigation of culture, nature, and the sacred in the context of the ultimate spiritual and existential question: death and the afterlife (while working within a VAS philosophy). Fall 2017: co-taught with American architect Rick Joy (the 2017 Walton Critic), this studio considers the house/home as the point of intersection between existence, nature and transcendence within a highly conceptual, experientially sensitive, place driven and VAS architectural framework. Fall 2016: co-taught with Indian architect Prem Chandavarkar (the 2016 Walton Critic), this studio was centered on how architecture may advance human vocation and development in every day social and spiritual practice and within a VAS platform. Fall 2015: co-taught with architectural author, critic and editor Michale J. Crosbie (the 2015 Walton Critic), this studio looked at the shifting landscape of spirituality taking place in the U.S. and abroad, and what this means for the future of sacred space. Fall 2014: co-taught with Argentinian architect Eliana Bórmida (the 2014 Walton Critic), we studied the relationships between nature and everyday life as foundations of architecture and the transcendent, with particular attention to phenomenology. The inquiry followed a VAS paradigm. Fall 2013: co-taught with British-Italian architect Claudio Silvestrin (the 2013 Walton Critic), this studio focused on design processes and methods that advance contemplative, intuitive, and non-egotist ways to question, critique and propose essentialist architectural solutions. The investigations followed a VAS perspective. Fall 2012: co-taught with Spanish architect Alberto Campo Baeza (the 2012 Walton Critic), this studio considered architectures enabling contemplative practices vis-a-vis two different building types: a convent and a nature observatory. The investigations followed a VAS viewpoint. Fall 2011: co-taught with Finnish architect Juhani Pallasmaa (the 2011 Walton Critic), we studied the role of emotions in architecture (and contemporary culture) and used funerary architecture as our vehicle of investigation. Fall 2010: The studio investigated the connections between VAS and Spirituality in light of Thomas Merton's teachings and the inspiration of the beauty and culture of the four-corners area of the United States. 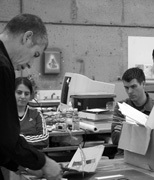 Architect Craig Hartman (the 2010 Walton Critic) directed a week long workshop. Focusing on the body and the senses as central to the understanding, design, and experience of architecture. Investigation of architectural design methods and processes through design practice, comparative analysis, and self-criticism, both theoretically and practically. Consideration of Sacred Architecture from comparative, spiritual practice, and hermeneutical perspectives..
Study of the relationships between transcendence and architecture using analytical and phenomenological methods. This class is not a survey course of past and present architectural theories but about learning how to read, think, write, and talk/argue about architecture. It is about the power of rhetoric in creating and receiving architectural meaning and value. Examination of meta-cognitive, affective, and representational methods enabling a phenomenological realization of architecture, self, and beyond.